Raccoon Baffle for bird poles is designed to raccoon and squirrel proof bird feeder poles. This Raccoon Baffle for poles is a hollow cylinder baffle that is free to sway making it extra difficult to defeat. The raccoon baffle is a large baffle with its 24 inch long and 8 inch wide diameter. The baffle stops the raccoon, squirrel, and chipmunk from climbing up 1 inch diameter poles to the bird feeders and bird houses. 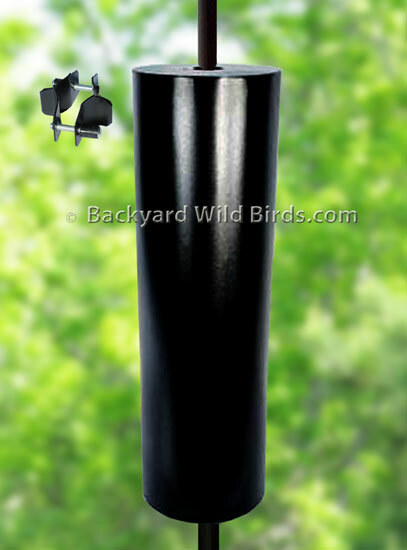 This Cylinder Raccoon baffle can also be used on 0.5 inch up to 1.375 inch diameter bird feeder poles. Mount on the bird feeder pole about 4 to 4.5 ft off of the ground to the baffle top, for effective blocking. Baffle includes an adjustable mounting clamp to set at the desired height. It is actually mounted on the pole and then the cylinder must be able to slip over and down the pole to rest on the clamp. This flat top cylinder baffle is all steel with a power coated black semi gloss finish. Get a large Raccoon Baffle and forget about the raccoons and squirrels.